2400 meters mounted on 25 kilometers. This is what awaits us today. And up, it will cross the famous "Sea of ​​Sand". Sand and bike / trike does not mix, and when you ask people around us if it's possible to cross bike, we get an answer and its opposite. However, reliable sources, this is not the right time to cross because it has not rained for a long time and the sand is deep enough, too much for my little wheels 20 inches wide enough to float above the ashes. With Zhuyyin and Henry Malang, the solution takes shape. We finally take a pickup to go up and cross the Sand Sea. 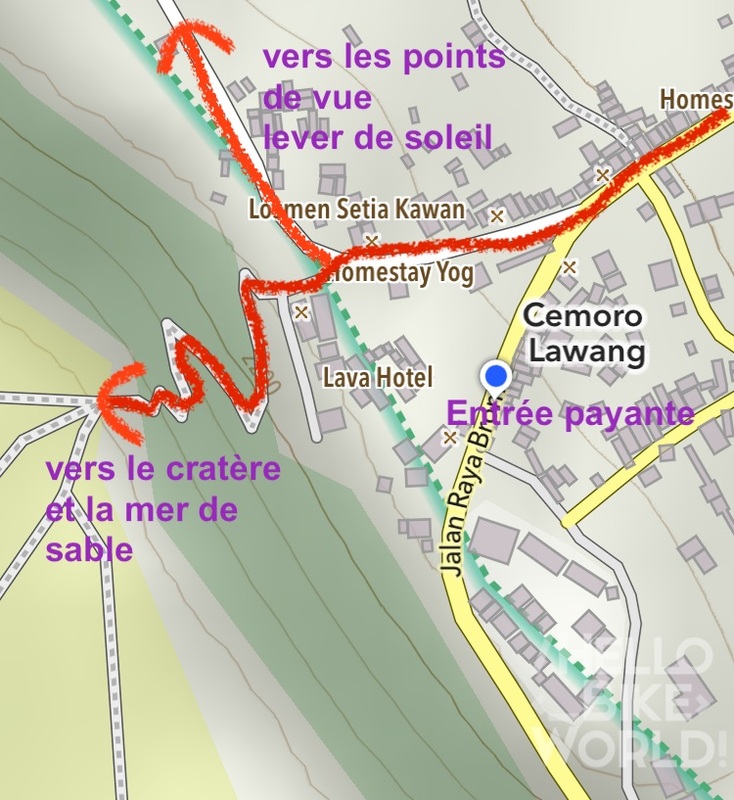 It's never an easy decision because it is not the idea of ​​travel using motorized means, but we are a little pressed for time (Our parents arrive on 23 April in Bali !) and we would not be stuck in the sand. It's still more 10 kilometers, it would take a full afternoon to push the bikes in there. So it is both pleased and disappointed not to defeat the neck by the force of our legs as we climb the summit by car. In the back of the truck with bikes, crossing the oncoming traffic to 2mm and crossing mounted over 20% Like nothing ever happened, all at a speed far exceeding my desire adrenaline of the moment. 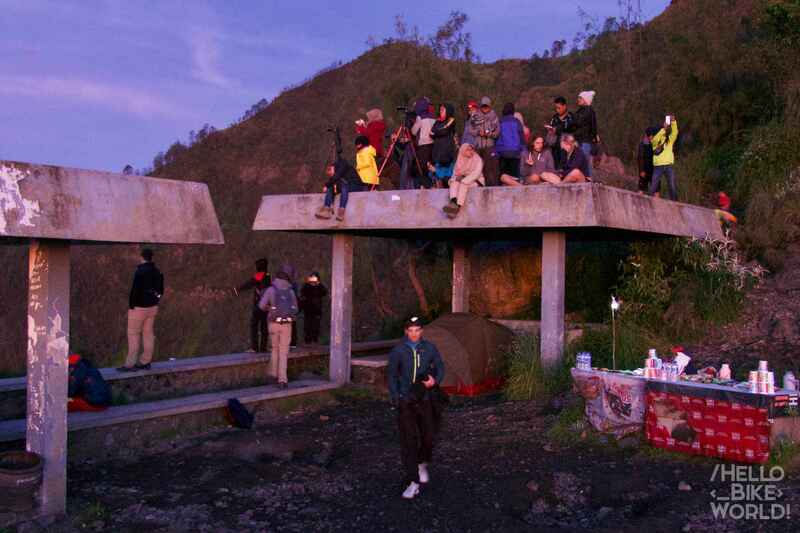 We pay the park entrance, 220K IDR per person (16$). There she is, the Sand Sea ! Effectively, difficult to cross bike now, and completely impossible trike. 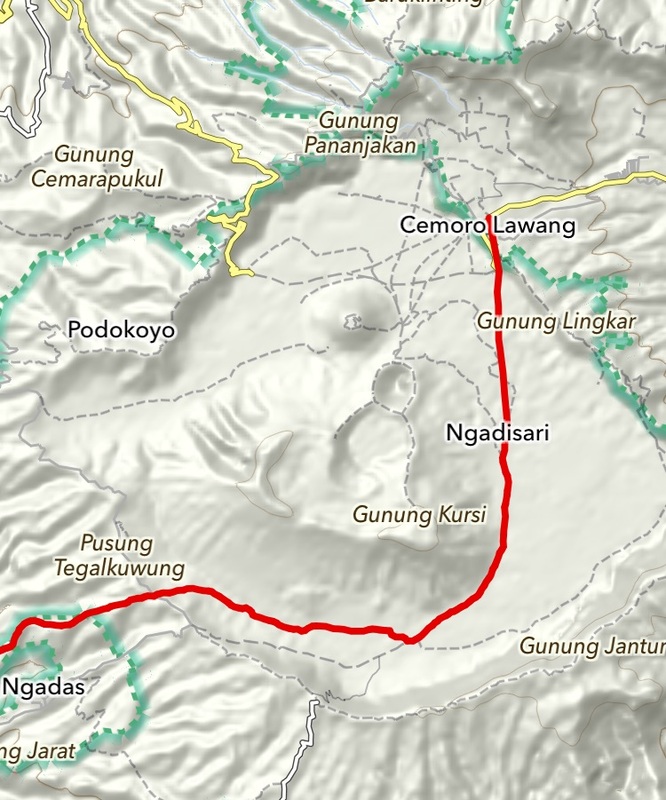 We're actually very happy with our decision, that we returned to 700K IDR, is around 50$ to cross the pass from Malang to Cemoro Lawang. We get off the bikes pickup, make our farewells to Zhuyyin, Henry, our driver and his friend whose names escape me. Thank you to them for helping us find this great solution with a suitable vehicle, I have not even had to disassemble and fold my trike ! We collect some provisions (piseng of goreng = fried bananas and other fried fatter) greasy spoon in the granny in the village, 2000 IDR piece (is 0.15 $), ask the bikes in front of the Bromo park admission office that sufficiently secure air, despite the constant crowd around my trike. We take some warm clothes, the bedding and tents and go for the evening tour. We will ask the tent at the observation point from sunrise to be at the forefront of this show the next morning. After an hour's walk, we come to. There's nobody up on the view, we put the tent under a small shelter and admire the sunset. We are so pleasantly surprised to be the only ones to have had this idea ! The sunset is already incredibly beautiful. 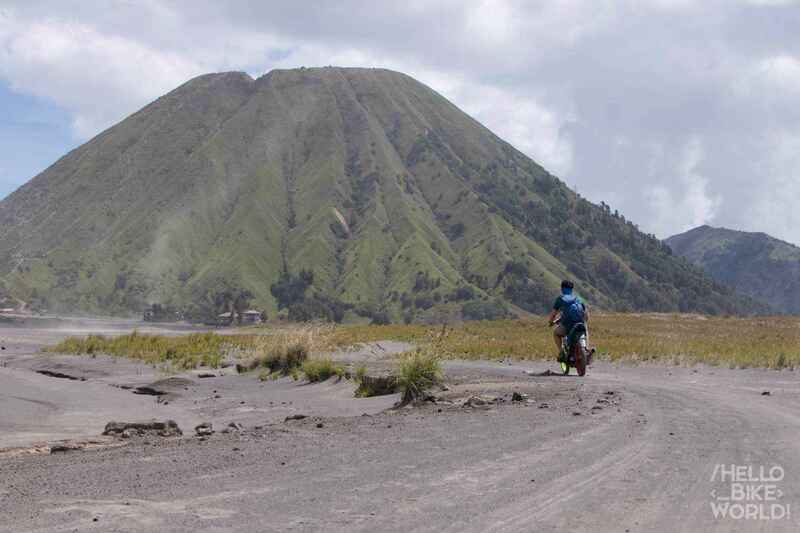 This is not the Bromo ! Yeah, it is in fact Batok. 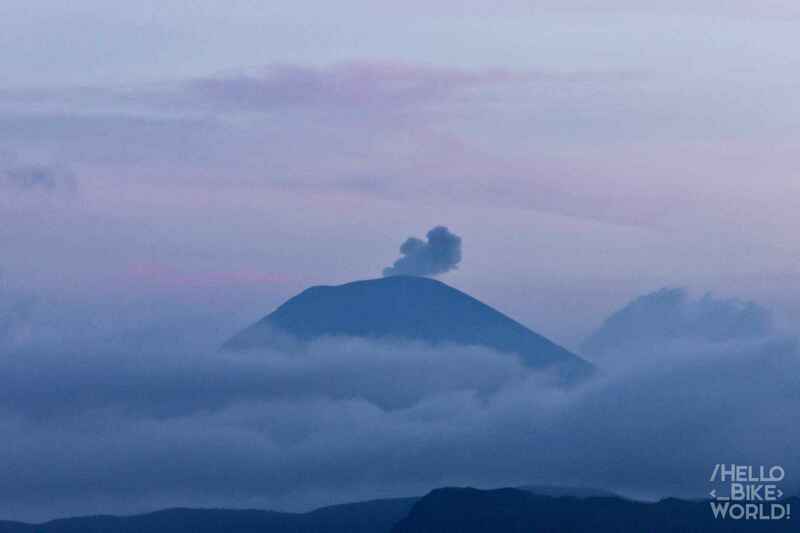 The Cemuru volcano makes us one last fireworks show before the night ! At 5:30 p.m. it is already dark, we fall asleep to 7:30 p.m..
around 22:30, we are awakened by the sound of footsteps and voices, we are not alone ! Tourists accompanied by their guide just arrived to turn up their camp, only 2 tents. Around 3:00 am, other tourists arrive, without trying this time. Sunrise is scheduled for 5:20 this morning ... These tourists will thus have to wait more than 2 hours in the cold (it should be less than 10ºC). We have yet no pity for them because they broke our sacred sleep. My sleeping bag, comfort temperature 20ºC, is at its limit and I tremble a little cold. We open the closure of the tent, the purple-orange colors begin to appear. A level up color bright sun ! We discover fun with twenty people perched above our tent, accompanied tripods and cameras with protruding goals. They must be there for more than 2 hours those there ! While we were sleeping peacefully just below. 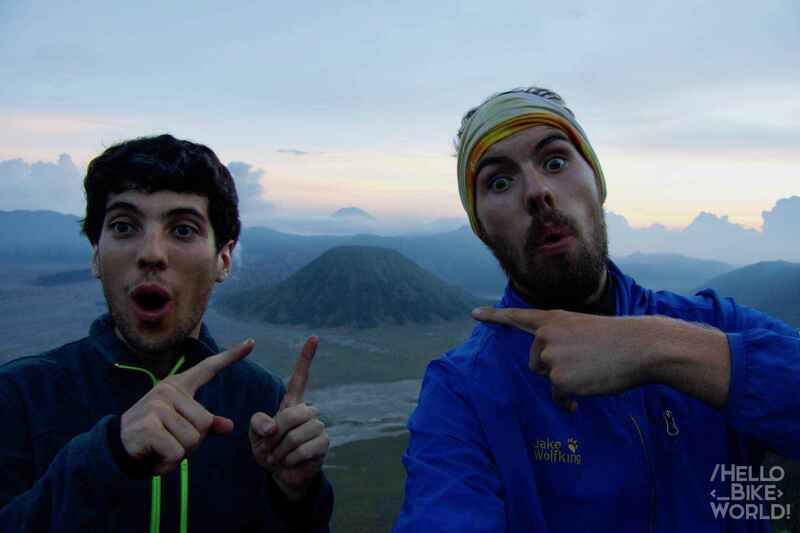 Kilian leaves the tent and we discover twenty tourists perched above our tent ! We see before us refrigerated tourists and falling fatigue take, two, Three photos can already go down, dragging feet a little. They had to get up early the buggers, easily 1 or 2 hours ! 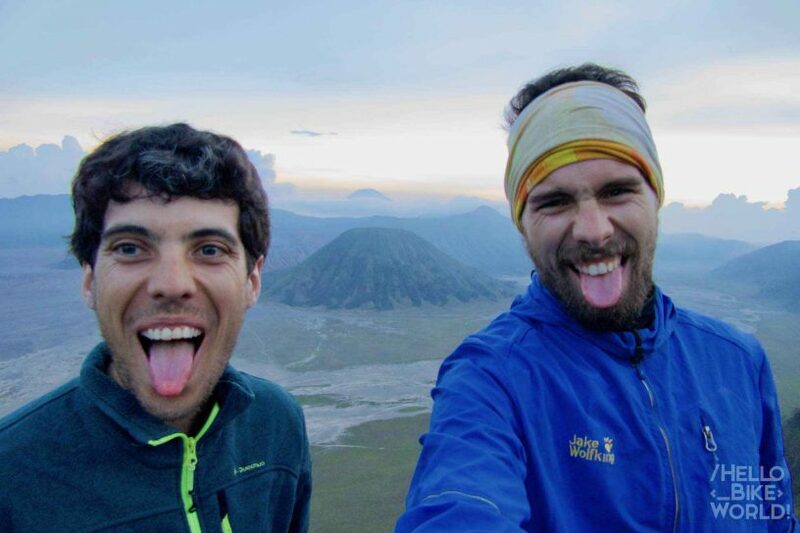 And it's not over for them because they will soon resume a vehicle to continue with the Ijen volcano with a hike in the night. Who said organized tours allowed to travel relax ? However, we understand the interest of the thing. 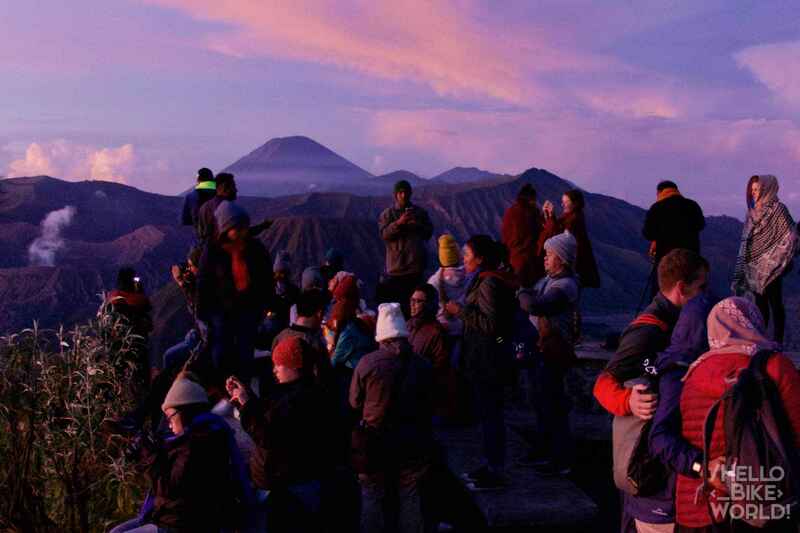 It is beautiful Bromo (and Batok and colleagues Cemuru) with these colors morning. After having dismantled the camp and strafed the Bromo, we descend cheerfully, in good company Pauline, Naomi, (two Swiss countrymen !) and Camille (neighboring France) with whom we share our impressions of the trip, The fear of the Unknown, mass tourism, among others ! It's only 8 and in our head, it is as if it was the middle of the day already. 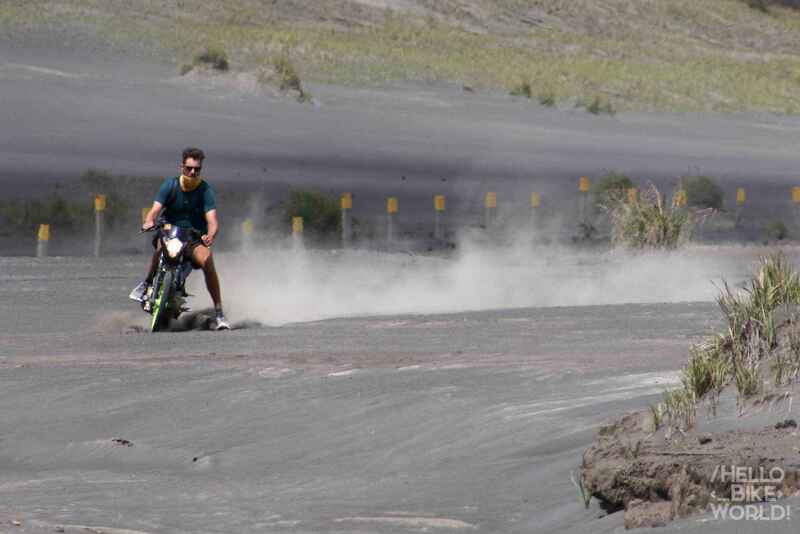 A student had proposed the day before his two motorcycles hacked himself to see the crater and wander around the sea of ​​sand. For IDR 300K (20$), We have 2 bikes for the day. This is a standard scooter and small motorcycle / moped pot over-sized, is meant to 3 km radius around. I will become now one of the people I most despise… It can make 150 km / h according to its designer. Having no helmet, I'm not going to verify its contention ... It's nice to be able to go 150 km / h, already must get to the start and do not stall as it is very capricious ! Let's go, we are on the slippery sand ! We have fun like crazy between dunes and endless dishes. 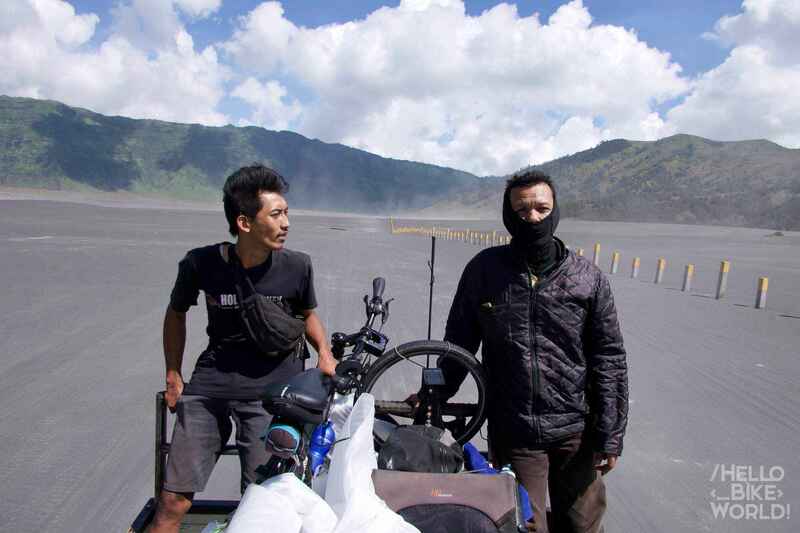 Finally, we ask motorcycles at the parking lot before the final trek to the crater of Bromo. We pay 5,000 rupees parking (even if we could have just put the bikes outside the parking lot ... often realize too late that mistake). I managed to forget the key in the ignition… Finally, I was happy that my “precious” bike roughly monitored. 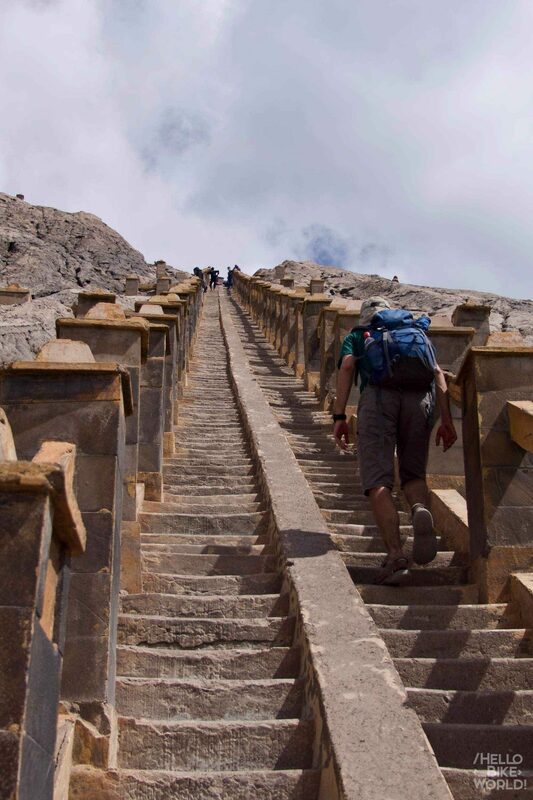 Such amount to the gods Mount Olympus (Yes, it's good ego), we go up one by one the endless steps to the crater. It smells of sulfur but nothing that requires the purchase of the mask that is desperately trying to sell you everywhere. However, I fall for the "gift" to throw into the crater but mainly because the seller climbed all the steps with us, chatting amiably. What changed from one that was trying to get me whistling like a dog. 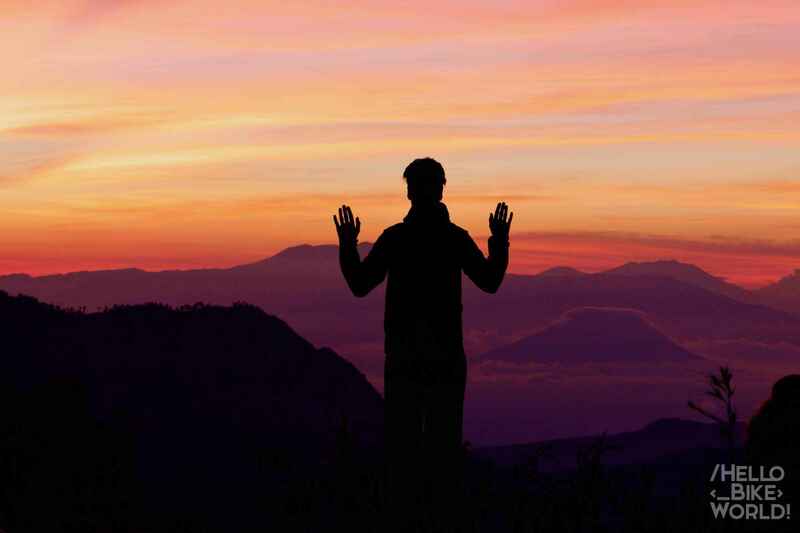 Some "prayers" pronounced with Kilian to celebrate our reunion, what we have achieved and what we will accomplish. 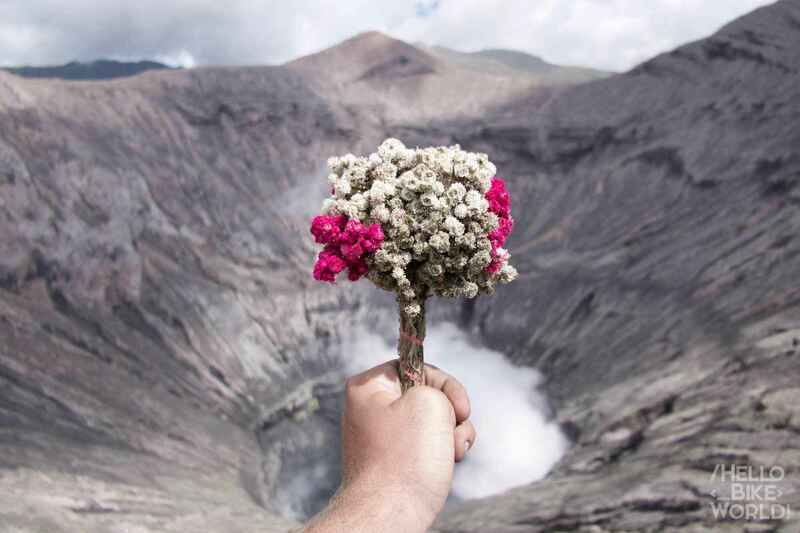 We throw our same flowers that fly to the elegantly crater… and crashing miserably on the pan of the crater by reaching other offerings currently decompose nicely. I then dwell on the crater floor. You can see the boiling lake of green pistachio. We would not really swim but the color is quite flashy. I observe around me, the desert, the rock, nature ... I feel so good in this environment and above all so much better than in the centers of large cities ... 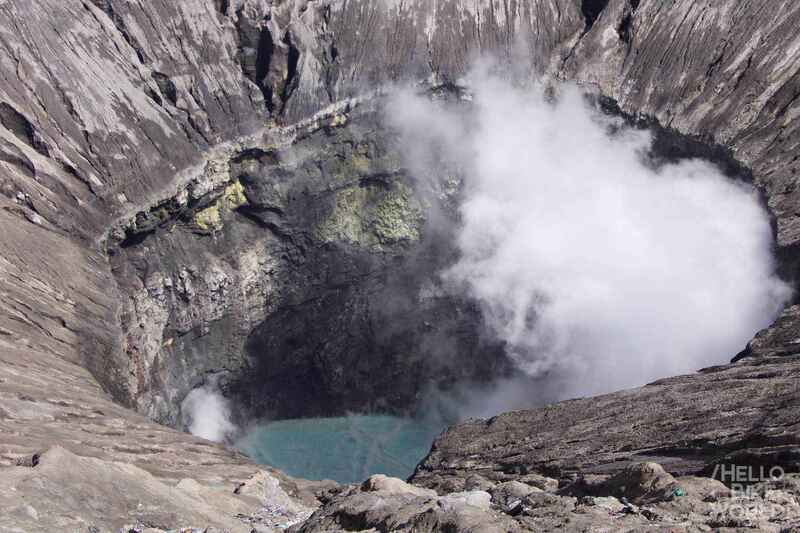 The demonic hordes of Jeeps organized tours are a party towards another volcano, following to the minute the crazy schedule of volcanoes tower known Java (Package Bromo + Ijen Kowa and 24h, lively tourism !). It makes the bikes mid afternoon. The scooter Kilian does not have the key in the ignition. Yes, I did not tell but she kept falling, And this, even with the scooter started ! I had already had to make a research mission earlier in the day, which fortunately proved successful ! Kilian off again into the desert to find the key. I wait by eating a small Bakso (a good soup with meatballs, tofu and some noodles). I do not know why but I know he will find her, even if there is almost no chance of finding a needle in a haystack a key in a sandy desert. Sure enough. 20 minutes later, Kilian returns victorious air. 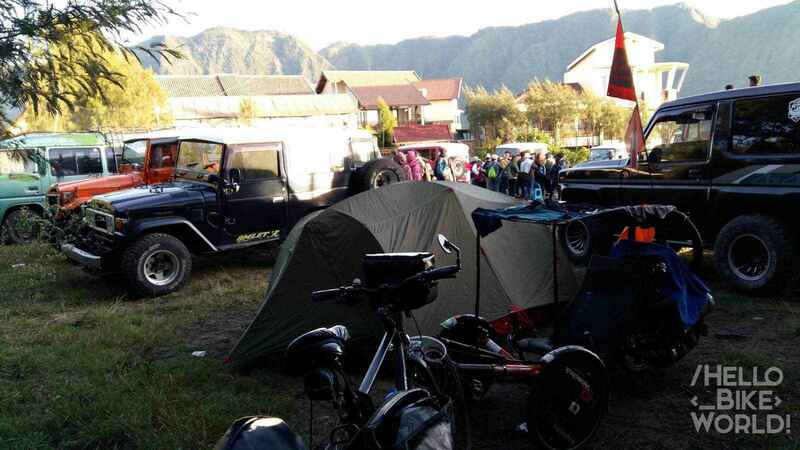 bikes are recovered, and will put our tent in the camping place "official" village, behind Lawa Village. This is a kind of football field. In any case, there is a goal focused manufactured bamboo. Person and almost silent. True to our habits, we fall sleep to 19h. From 4h, the roaring engines of the horde of Jeeps leave us the comforting sleep. I can tell you that there are better as an alarm clock. A campsite or jeep parking !? I take this paragraph for a little reflection on this type of tourism… Everything is in excess. And everything moves fast. The hordes of tourists arrive in the night and leave ALL between 9 am and 12 am. In the village, the morning, is two unbroken columns of vehicles that occupy the road and pollute the air with their unfiltered diesel. I write this article in addition to a cafe right side of the road waiting for the queue of jeeps fades before returning to Probollingo, At the seaside. That's about 2 hours it lasts. Nevertheless, what good breath of fresh air this Bromo (Diesel with a key) ! 6. Conclusion : Come anyway, Is it worth it ! I do not want to discourage you to discover this beautiful place but perhaps is it better to study alternative ways to come here, public transport such. And most come by autonomy ! There is no interest in being in a convoy of jeeps amid this sea of ​​sand, to do the same thing that everyone at the same time, knowing that an hour later, there will be no one ! Sunrise worth, but the view is an hour from the village and it is useless to come too soon ! 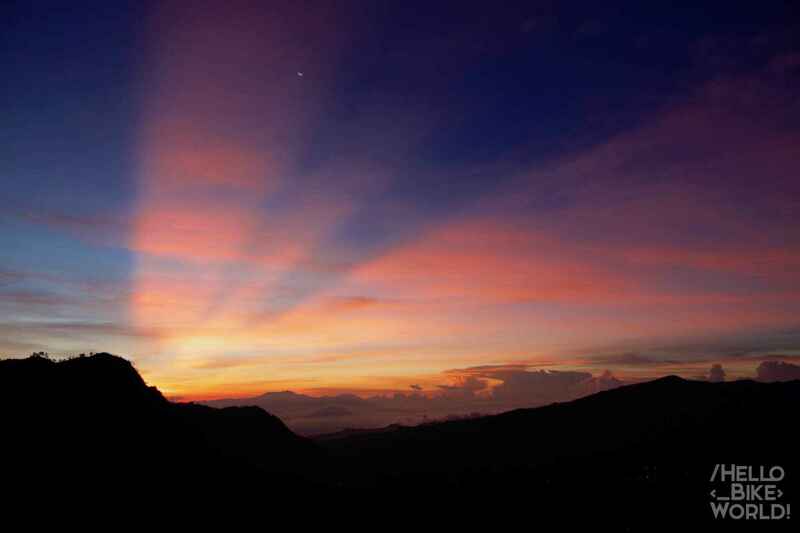 You will not have better views than others and the beautiful colors are gradually anyway. 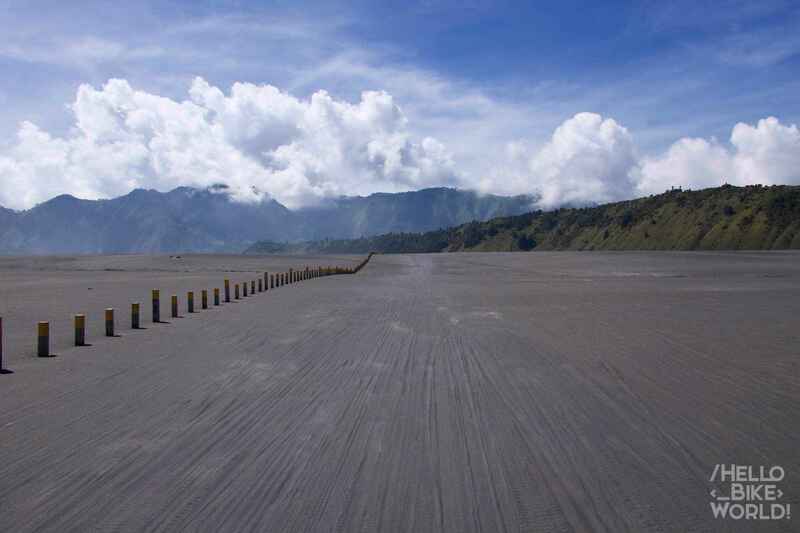 The entrance fee is in Cemoro Lawang, but after the junction that goes to the views. If you only want to observe the volcanoes without venturing into the sea of ​​sand and the crater, you do not need to pay the park entrance. 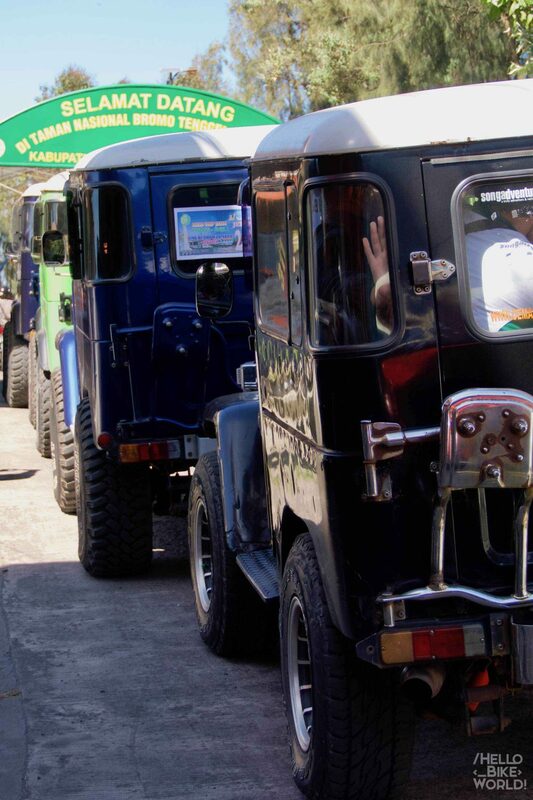 There is also a way to avoid paying the park entrance along a small path to the Sea of ​​Sand. This is done only on foot. I hope I still managed to make you want to come and visit this magical place, which is worth a visit , at their own pace ! Passionate about cycling and adventure, Nature lovers and Technology.